The 6.8 Remington Special round was developed by Remington, with help from both the U.S. Army Marksmanship Unit and USSOC (United States Special Operations Command). It was developed as a potential replacement for the 5.56 NATO in carbines and short barrel rifles. It is in between the size of the 5.56 NATO and the 7.62 NATO, and has better terminal performance than the 5.56 NATO. This Open Tip Match (OTM) round from Remington has excellent ballistics, and is made to match standards. Open tip match ammunition is the same as match grade hollow point ammunition, and thus has the same ballistic properties. 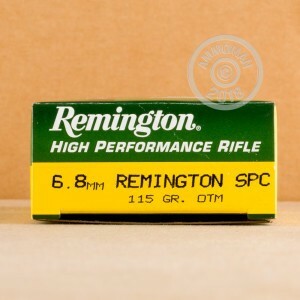 6.8 Remington SPC rounds are perfect for marksmanship training, and shooting competitions. They can also be used for hunting whitetail deer, but OTM ammunition is not the best for this application. 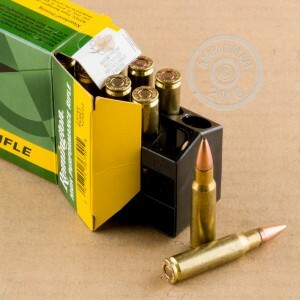 This ammunition is non-corrosive, boxer primer and has re-loadable brass cases.